Marvin Smith opened Ollie’s Trolley on the corner of Liberty Street and Central Avenue in 1993. Housed in an old trolley car, the restaurant is one of the last three remaining Ollie’s Trolley restaurants of what was once a 100-location franchise (the other Ollie’s restaurants are in Louisville and Washington, D.C.). To a passerby, Ollie’s Trolley may appear to be a humble little lunch car, maybe even a gimmick. But there is more than meets the eye to this West End staple and its owner, Marvin Smith. When Smith bought the vintage trolley car restaurant, he had big plans for building his business. He even hunted down the original franchise owner — John Y. Brown of Kentucky politics and fried chicken fame — and asked to purchase the rights to use its recipes and the Ollie’s Trolley name. Brown gave his blessing and signed them over for $1. The new Ollie’s Trolley was soon moved from its location at 6th and Sycamore downtown to a lot Smith owned in the West End, adjacent to his own residence where it sits today. The signature item at Ollie’s is the Ollieburger, a remnant of the original Ollie’s Trolley menu. But, since he opened, Smith has expanded the menu to include breakfast, ribs, chicken, and fish. Full plate meals include soul food sides like fresh collard greens and green beans. Popular items with nearby Sam Adams Brewery employees and neighborsA third of Smith’s business comes from workers at the neighboring Samuel Adams brewery, including third-shift workers looking for dinner in the morning and truckers coming back and forth from deliveries. Everything is hot and ready when the restaurant opens at 9 a.m. every day. Smith does most of the heavy lifting in the prep kitchen and outside on the grills. He also does most of the catering, which is another half of his business and how he twice found himself in the company of President Barak Obama. When a customer from Indian Hill held a fundraiser for (then) Senator Obama, Smith served the Obama family and their guests a VIP breakfast downtown. He later catered a 500 Women for Obama event at her home. Deep fried Thanksgiving turkeys are a hit, too. 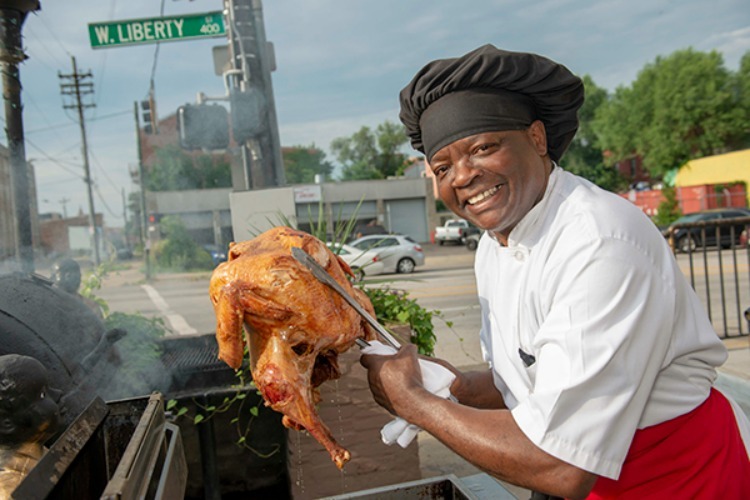 When turkey season rolls around, Smith rolls out 20 fryers onto the patio where he fries up a couple thousand turkeys for customers. Smith deep fries a couple of thousand turkeys each ThanksgivingBefore Ollie’s, Smith was not a restaurant man but definitely had an entrepreneurial spirit. After attending college at Wittenberg University and then Graduate School at Xavier University, Smith began his career with the Kroger Company. The job didn’t last long. To help with his professional development, his supervisors had him write down his goals and then gave him a book called How to Get Control of Your Time and Your Life. He read the book, reconsidered the direction of his life and career, and then he promptly quit. After that, he worked for a low-income housing nonprofit and began to invest in real estate. That is how he ended up owning his property in the West End where Ollie’s is today. While Smith is never really off the clock at Ollie’s, he does have another job. At night, he teaches Business and Society classes at Chatfield College, both the cornerstone and capstone classes for the two-year program. This is not Smith’s first job as a teacher. He served one 4.5-year tour of duty in the Air Force during the Vietnam War. He worked as a Class A welder, stationed in Thailand. It was at the end of the war and he was training Laotian pilots to fly and repair American aircrafts. Chatfield College may be a world away from Thailand, but teaching students here employs the same “watch me and do as I do” spirit. The West End community is currently making headlines for a big money deal to build a new MLS (Major League Soccer) stadium just blocks from Ollie’s. In a community with mixed opinions, Smith supported the MLS deal. “My position is that it’s good for the neighborhood. I think it’s good for development,” he says. Any new development of that scale brings investors looking to get in on the deal. Smith says that the Samuel Adams brewery has always showed interest in buying Smith’s property, but now outside investors want it, too. They don’t want to buy Ollie’s, specifically, just the prominent corner lot it sits on. Smith estimates he has six active proposals sitting on his desk right now. Someday, Smith will likely divest himself of his real estate, cash out, and focus more on teaching. But with so many changes on the horizon for his neighborhood, he’s not in a rush. He’s talking to mentors, trying to make the best decisions for himself and his business. He’s also looking out for the people who work for him — many who have worked for him for 15 or 20 years — and the neighborhood they’ve served for 25 years. He’d like to pass the trolley on to someone who is invested in it already. Smith thinks only time will tell what the new stadium brings for business. He says getting even a fraction of the 30,000 fans per game would be significant and he’s got a few ideas for how to “juice the place up a bit” for the soccer crowd, including a canopy and a liquor license. He imagines the West End as a place where people can park their car, walk a couple blocks for a bite to eat, and then go see the game just like they would do around any other ball park in any other city. Except that, in this city, they’ll be eating the Ollieburger. 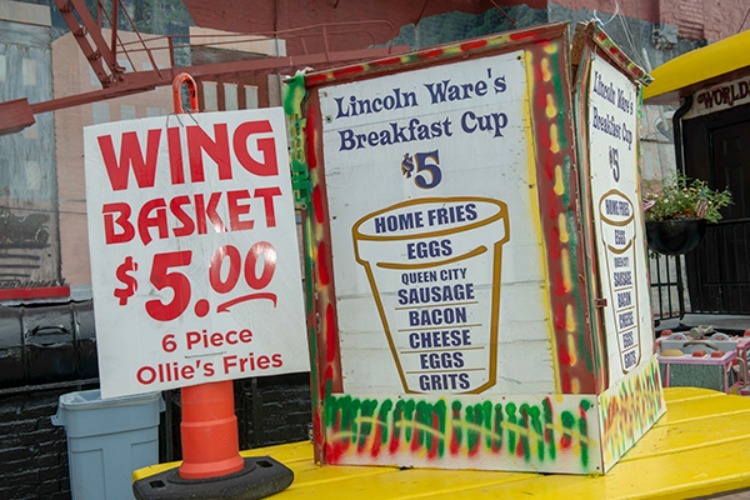 Ollie’s Trolley is open daily from 9 a.m.–7:30 p.m. (closed on Sunday) at the corner of West Liberty Street and Central Avenue in the West End. Outdoor seating and street parking only; bring cash. Go Metro with routes 6, 16, 20, and 67X. For a history of the Ollie’s Trolley franchise, click here.